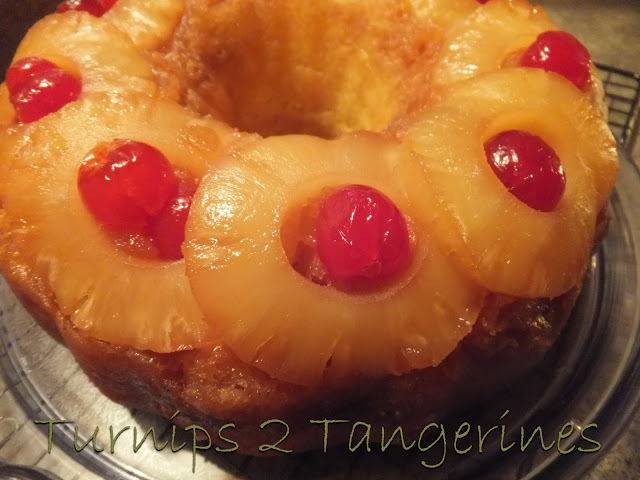 Pineapple Upside Down Bundt Cake is a true classic cake. It’s been around for a very long time. Traditionally made in a 9-inch cast iron skillet and usually made on top of the stove. Called skillet cakes because they were often made over an open wood fire in a cast iron skillet. Thus making them a special treat for pioneers and cowboys alike. Most pineapple upside down cakes are made from scratch but over the years that has changed. For this recipe, we used a classic yellow cake mix but you can substitute a white cake mix or a butter recipe cake mix. To add an extra layer of flavor substitute any of the ‘new’ flavored cake mixes that are now popular. Coconut, orange, lemon or even a ‘velvet’ flavor would be terrific in this recipe. Experiment with cake mix flavors and fruits. Try peaches, pears, plums, and see what you like best. Add flavored extracts to the batter too. 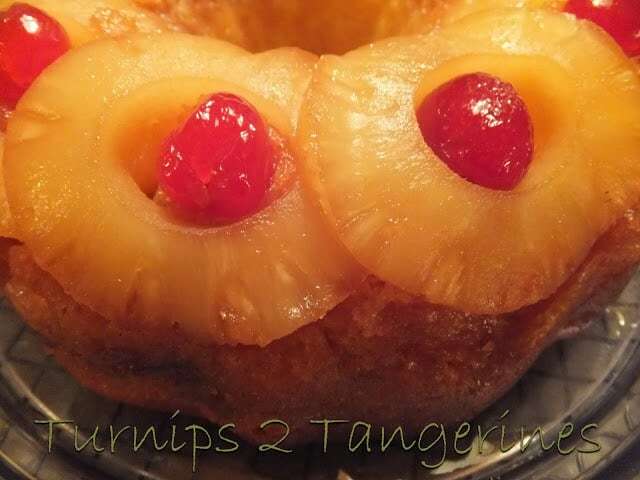 Traditional upside down cakes have very little cake vs pineapple topping. After all, pineapple upside down cake is all about the gooey, caramel, buttery, fruit topping. Add a scoop of ice cream or whipped cream, who needs cake! Pineapple Upside Down Cake along with Bundt cakes, which were so popular in the 1950’s and 1960’s are making a comeback. Another generation will be enjoying these super delicious cakes. In the late 1800’s, the term ‘upside down cake’ first began appearing. Until then, this type of cake was referred to as skillet cakes. Skillet cakes came about out of practicality. Cakes were made in cast-iron skillets on top of stoves due to ovens being unreliable. Cast-iron skillets have been around since the beginning of time. (Well not really, but darn close!) Inverting a cake to reveal the fruit topping dates back as far as the Middle Ages. The first upside-down cakes were not even made with pineapple but with seasonal fruits such as apples, peaches and cherries. Canned pineapple had not yet been ‘invented.’ Canned pineapple manufacturing didn’t begin until 1901 when Jim Dole established the Hawaiian Pineapple Company, now called the Dole Company. Dole began producing/marketing large quantities of canned pineapple. Canned pineapple from Hawaii was a real luxury back in the day. 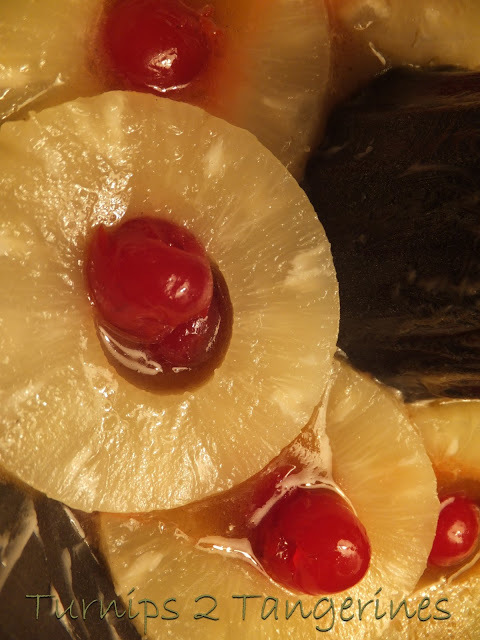 In 1928, the Hawaiian Pineapple Company sponsored a contest for pineapple recipes. The judging panel consisted of judges from Fannie Farmer’s School, Good Housekeeping and McCall’s Magazine. It’s said that 2,500 of the 60,000 submissions were recipes for pineapple upside-down cake. The company decided to run an ad about the flood of pineapple upside-down cake recipes it received and the cake’s popularity soared. In a small saucepan, melt butter over low heat, add brown sugar and stir until sugar is melted. Remove from heat and set aside. In large bowl prepare cake mix according to package directions, except use reserved pineapple juice instead of water called for in recipe. If you don't have enough pineapple juice, make up the difference with water. Spray bundt pan with cooking spray. Pour melted butter/brown sugar mixture in bottom of bundt pan. Arrange as many pineapple slices as will fit in bottom of pan, overlap slices if needed; save remaining slices for another use. Place 1 or 2 cherries in the center of each ring. Carefully pour batter over pineapple/cherry studded slices. Bake according to package directions for bundt pan. About 40 minutes. When cake is done, remove from oven and let cool on a wire rack for 5 minutes. Place dinner plate over top of bundt pan and flip cake over and out onto a serving plate. Serve Roasted Garlic Pizza Crust for dinner and Pineapple Upside-down Cake for dessert. Hi there! Stopping by from Love in the Kitchen's 4/24's Tuesday Table party. 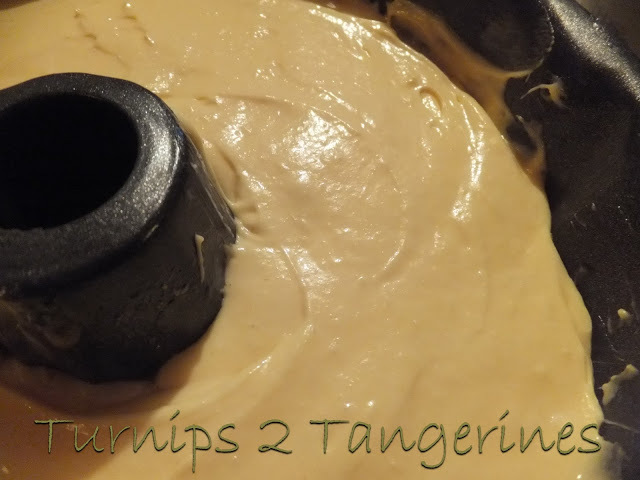 I hadn't ever thought of using a bundt pan either – great idea. Thanks for sharing! SherryO @ Who Needs A Cape? I love pineapple upside down cake and this looks fantastic! Thanks for sharing! So Mad Men… cool. I always wanted to make this wonderful retro dessert. Thanks for sharing it with us on foodie friday. 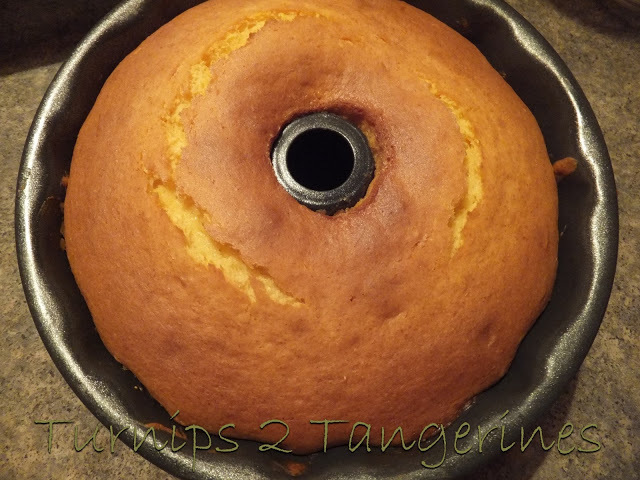 OOO, this is one of my favorite cakes…always baked mine in a cast iron skillet…but can't wait to try one in a bundt…..sooo pretty. This looks like a great recipe. We have a link party called Wednesdays Adorned From Above Blog Hop and would love to have you share this and any other posts with everyone. It runs from Tuesday night through midnight Sunday. Here is the link to the party. I love this beautiful cake. Thanks for sharing at Weekend Potluck. Wonderful recipe! I found your blog on the Fun Friday blog hop. I also have a linky party going on right now and would love for you to link up your recipe! This looks yummy! I never think to make this in a bundt pan! It seriously looks so good! It made my mouth water. It's so pretty too! This is so pretty! Sure it tastes wonderful, too.